If You’re Going To Play It Safe, You Gotta Take A Chance, a.k.a., Can The Royals Be Beat? If you’re going to play it safe, you gotta take a chance. Is this an incongruous, seemingly self-contradictory proposition? Yes, but it’s true in sports and in life, nonetheless. And just like “killing them with kindness,” it can be done. Life is full of oxymorons, hyperboles and exaggerations, and this is one of them. If you’re going to bet on a winner, put your money on The Kansas City Royals. Why? 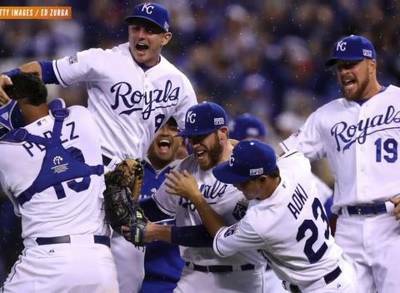 These Royals have only done what has never been done before in Major League Baseball History. (CORRECTION: The 1976 Cincinnati Reds went 7 – 0 under the old format.) They’re undefeated in the playoffs. An also ran, wanna-be, woulda-coulda-shoulda-be team for 29 years, and all of a sudden, out of the Royal Blue, here they come. To go undefeated in the playoffs is UNHEARD OF in Baseball. It’s improbable. It just doesn’t happen. And yet these same Kansas City Come-Out-Of-No-Where whiz kids are headed to the Fall Classic with eight victories and zero defeats. If you’re going to be on the safe side, you must live on wild side. And so it is in sports and in life. Sports is so much like life and life is so much like sports it makes my head spin. Sometimes you bet on a sure thing, only to come up with no thing. And other times you bet the farm on a longshot, and you come up with a game winner. The lesson from the 2014 MLB playoffs is clear: in order to be like these Royals, you need to put your hopes on hold for what seems like an eternity, put together a Johnny-come-lately, nobody gives you a chance, it-aint-supposed-to-happen-this-way team, and then just go for it. It’s so spiritual it’s almost scary. If you’re going to win big you must first die-hard. That’s the formula. Nothing, absolutely nothing worth anything comes without rejection and repudiation, sacrifice and suffering, and submission and surrender. So while we’re all giddy and glad and aglow for the Royals, just remember what they’ve been through in order to get to where they’re going to. For 29 years the laughingstock of Baseball; now, they’ve set an all-time record for winning and set a winning percentage that may never be matched. They’re batting 1.000, for Pete’s sake! If you’re going to be on top, you have to know more than a little about being on the bottom. Twenty-nine years of futility is pretty awful, and eight up and none down, IN OCTOBER, is pretty special. And so sometimes you don’t start out as the favorite, you just end up one. And these same bottom feeders are on their way to the World Series for the first time in a forever. If you’re going to hit home runs, you’re going to have to endure strike outs. The favored and fair-haired, preferred and privileged, choice and chosen players and people and persons don’t always end up in first place or win the trophy or get the ring. It’s the ones who persevere over time and persist through trials and tribulations. These are the underdogs. We love them because we are them. The underdogs of the Bible and in sports give us muster and metal, bravery and buoyancy, and the spirit and sparkle to endure the years of struggle and the fears we juggle as we fight through to our seasons of destiny. So go Royals! I say they win the whole dag ‘gum thing. And it would be extra special if they go all the way AND go undefeated and unbeaten and unblemished in post-season play. It would be the icing on the cake and the cherry on top of the miracle in the making we’re watching right before our very eyes.